Posted March 17, 2016 by Melissa Slive & filed under Blog, Learn How to Prep. I don’t know about you, but it is not often that I see someone walking down the street wearing two hats. 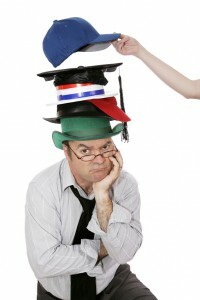 Yet, metaphorically, students often wear two hats when they address the grammar section of the SAT/ACT. And, as we know, wearing two hats is a fashion no-no! There are two types of questions in the SAT/ACT grammar section – Mechanics of Writing and Rhetorical Skills. These words sound scary and complicated, but they are not! Simply, Mechanics of Writing is a fancy name for GRAMMAR and Rhetorical Skills is a fancy name for WRITING (paragraph and passage organization and style). The problem with standardized tests in general is that students taking these tests get OUT OF CONTROL. Meaning, they take their new, sharpened pencils and simply answer each question as it appears. They answer, of course, in order. Yet, this is NOT a good strategy and the SAT/ACT knows this. The test WANTS you to become out of control because out of control equals more questions incorrect. You are expected, in a sense, to wear TWO HATS because the SAT/ACT mixes the two types of questions – Mechanics and Writing Skills. You might answer three grammar questions and then BAM – you are confronted with a writing question that asks about the organization of the paragraph. The writing question is making you focus on the MEANING of the actual passage and it is difficult to focus accurately on meaning when you are busy thinking about punctuation! Therefore, wear one hat at a time. I want you to go through the questions in a passage and ONLY answer the grammar questions. Think grammar and nothing else. Circle and skip the organization/style questions, and go back to them at the end. Once you finish the grammar questions it is time to switch hats. The writing/organization/style questions revolve around the MAIN IDEA. So…wearing your MAIN IDEA hat, skim the passage quickly, thinking, “What is the point?” Also, make sure to read the title! Often an answer directly relates to this title. Then…read the paragraph that a question relates to, thinking, “What is this paragraph about?” Note the topic sentence, the details, and the concluding sentence. Thinking about it, I realize that clowns often wear two hats. Well, don’t be a clown – take control and wear one hat at a time. Perhaps a hunting hat because your job is to “hunt” using the WilsonDailyPrep strategies for the correct answer. This is the way to master the SAT/ACT grammar section. Stay tuned! Next week we will provide you with more strategies to deal with the writing/organization/style questions.